If you are starting your very first reunion it is not unwise to begin a year and a half to two years in advance. Seasons matter — do you have skiers? campers? sun-seekers? school children? Plan accordingly. A majority of all family reunions occur in between Memorial Day and Labor Day. Consider three-day school holidays at other times of year for variety; skiing over Martin Luther King Day or Presidents Day weekends. Set your first reunion date to draw as many as possible. Give everyone plenty of time to save both vacation time and money for the trip. Your reunion date might coincide with an important family event. You can choose a date arbitrarily. Or offer choices with a commitment to abide by the consensus of the group. Avoid a blanket request for dates. Don’t ask 50 people to suggest dates because you’ll get 50 dates and still no consensus. If, on the other hand, you suggest a choice of say, Thanksgiving or Fourth of July weekend, you’ll know your majority right away. 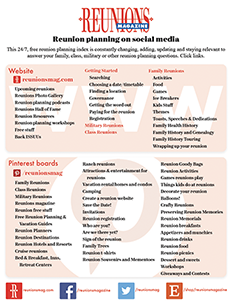 Over 70% of respondents to the Reunions magazine surveys report devoting two or more days to their reunion. Typically reunions start on Friday and last through Sunday, though some families stay longer. One whole week is not unusual. If members travel any distance, a longer stay makes the effort worthwhile with time to visit and relax before the return journey. The Seideman Family Reunion in Newburg, Wisconsin, has grown to an annual average of 400-600 descendants of Friedrich Seideman. They require a couple of days to set up a barn filled with a fascinating collection of family and farming history as well as games, a talent show, contests and food. They celebrated their 75th consecutive reunion in 2008. How often should you meet? Reunion frequency is an individual decision. Reunions are not inexpensive so time to save is essential. A surprising 46% of families make the reunion an annual event while 28% choose two years between reunions. The ones who wait five years may increase frequency for special reasons like significant anniversaries or members being ill and unlikely to make the next reunion. Frequency is also a serious consideration for the reunion organizer. One year passes rapidly while two years allow for some extra breathing room. When you have your reunion may seem to be easy for some, but for others it may be one of the biggest decisions to make. A very important rule of reunion timing is that you pick a date and stick to it. 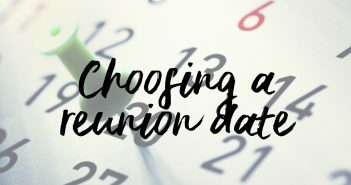 For many reunions some people may not be able to come the date you pick but if you change it for person, many others will have the same problem with your new date. Once you’ve announced the date, do not change it … you will save yourself many headaches. Barbara Taylor reported that many members of her Taylor Family Reunion (ages one year to 85) live around the country and have time off during the year end holidays because they’re teachers. Others hold vacation time until Christmas. Their reunions have been at state parks, hotels and condos. They enjoy eating out and being together for two or three nights after Christmas. Two of the families pay for their children and family’s cost as part of their Christmas gift. Our reunion is every two years for three days and everyone knows that two years from now there will be another. Last year our reunion was at our new home of only three months. Eighty plus people were here and we had a blast. Many of my relatives have tents or campers so our lawn looked like a campground. Our new neighbors may have wondered about us. Each family agrees to prepare one meal for a particular day including cleanup. Everyone pitches in. Meat and postage are paid out of a fund from a white elephant sale with items contributed by each family. Three days gives all the cousins a chance to really get to know each other. They exchange email addresses to keep in touch till the next reunion. One of our new neighbors took pictures so all of the family could be in the group shot as well as each family shot. One of my aunts collects photos and puts them in an album she brings along with past albums to the next one. Patty Breen Homan, Manheim, Pennsylvania, wrote that her Breen Family Reunion has met for over 30 years every Father’s Day weekend in New Hampshire. Most arrive on Thursday and all stay through Sunday. The first generation has eight sisters and brothers and now the children of the original eight take turns for all reunion details year to year. Each family has a turn every seven years (one of the original eight never had children). They make reservations (at a boys’ summer camp that’s a ski area in the winter), set up a list of assignments, plan weekend activities, etc. “We have a cookout Friday evening, a baseball game after breakfast Saturday, afternoon at the beach followed by basketball. Make your reunion your own family holiday! When should you have a reunion? What are good dates? How do you choose one? A family reunion typically starts when one person has an idea and shares it with other family members. Joyfully, many families love the idea, respond instantly and are ready to help. The idea of a reunion can generate support or rejection. Don’t let rejection slow you down. Proceed if there are enough positive responses and let the others catch up when they’re ready. “When?” is one of the most important reunion questions you’ll answer. How should you choose your date? Initially, the question of when to have your reunion seems fairly simple but don’t be fooled. Choosing and setting a reunion date is a crucial and important step. 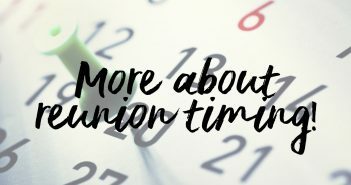 A cardinal rule of reunion planning is that once the date is set, stick to it. Establish a timetable to count down to your reunion. If you have no idea when to have your first reunion, picking a date may not be as simple as you expect. Surveying your family may seem the most democratic way to pick a date, but do so with a plan in mind. The larger the group, the more structured your request must be. For example, pick several dates and include them in your survey or questionnaire. Do you prefer date one, date two or date three? Their answers will guide you to fix a date. If you want a popular place, start years ahead. In large, extended families it’s rarely possible to accommodate everyone’s schedule. Choose the best date possible. Then stick to it.